With the new DB25 World Traveller, De Bethune created a second time zone and world time complication watch with an inventive display perfectly in line with the design codes of the brand. Simple to use but complex to realise, the DB25 World Traveller is characterised by the concentric arrangement of the functions. World times appear on a disc in the centre of the dial and can be set by using the almond-shaped push-piece positioned at 8 o'clock. This flexible and precise system moves the city display disc by one-hour clockwise jumps. The home time is indicated by the microsphere which moves in the graduated channel and can be set in both directions (clockwise/anti-clockwise) using the crown. This microsphere - which reminds the distinctive spherical moon seen in other De Bethune timepieces - has two halves that are used to indicate day and night. One half is blue for the night, the other pink for the day, and they reverse positions when they pass 6 a.m. and 6 p.m. 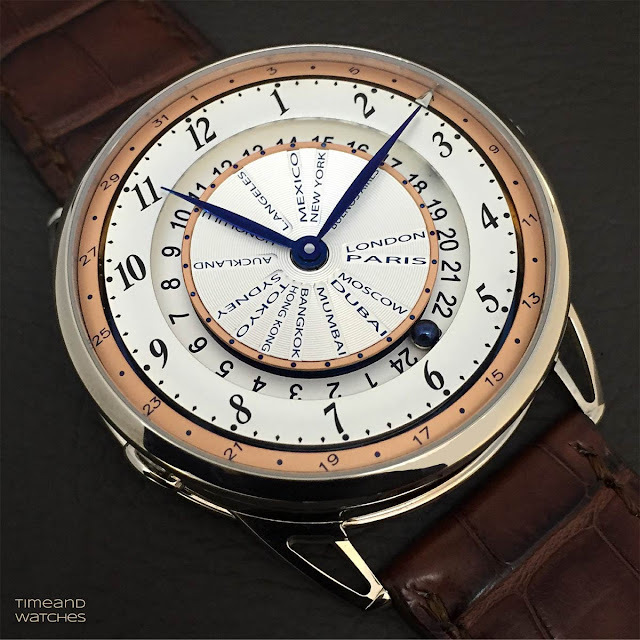 The local time is indicated on the hour circle by the blued leaf-shaped hands, whose profiles match the relief of the dial. 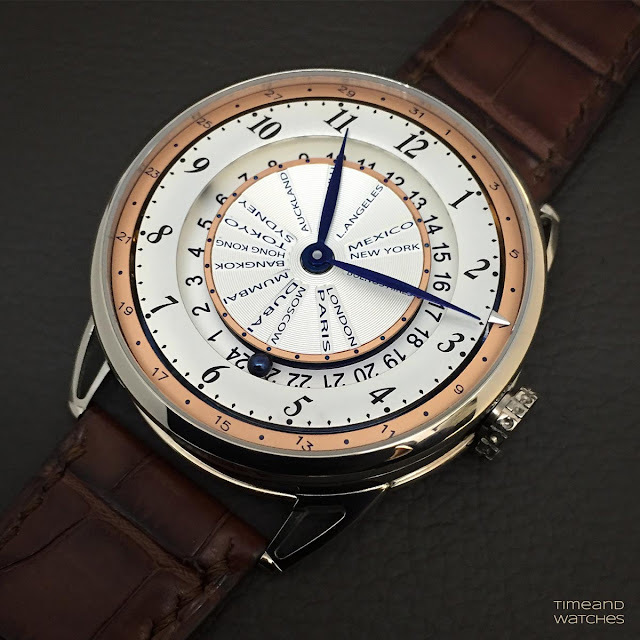 The minutes hand remains naturally coordinated with the reference hour, while the hours hand is controlled by the crown pulled out to the second notch. On the exterior circle, a jumping pointer indicates the date (coordinated with local time) which can be adjusted by a corrector at 10 o'clock. 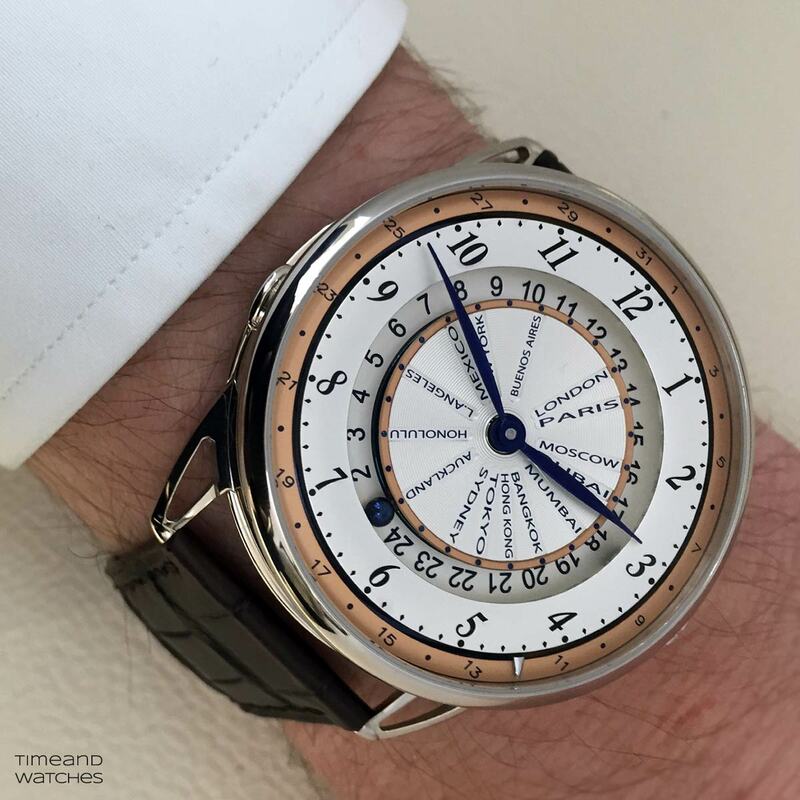 The readability of all the indications is enhanced by the large 45 mm diameter of the white gold case and by the champagne and silver tones of the dial which help sequencing the succession of the indications. Despite its large size, the case wears comfortably on an average wrist. 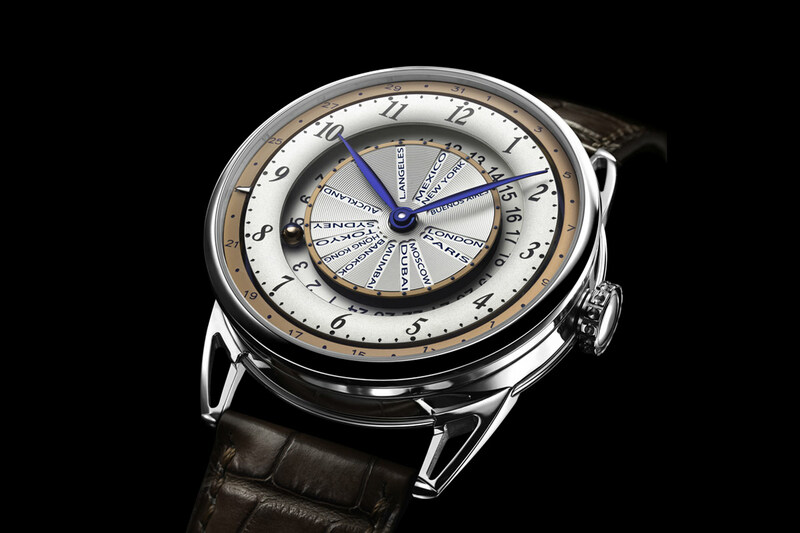 The DB25 World Traveller is powered by the hand-wound calibre DB2547, the 25th manufacture movement designed, manufactured and assembled in-house by De Bethune since the brand's founding in 2002. 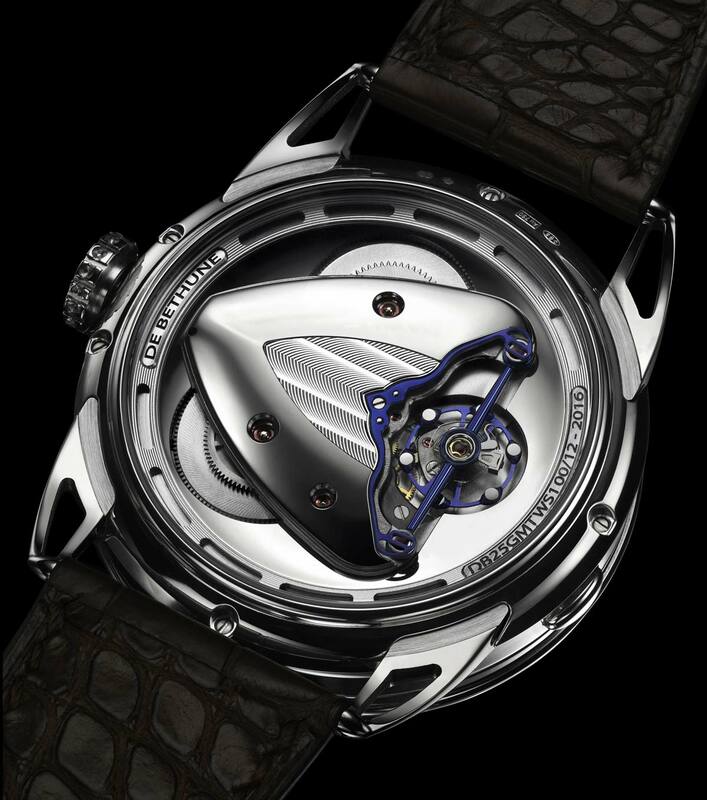 Beating at 28,800 vibrations per hour and comprising 430 parts, the movement offers a remarkable power reserve of 5 days ensured by a self-regulating twin barrel. The technical excellence of the movement is highlighted by the quality of the finishes with a central delta bridge embellished with a "Côtes De Bethune" decoration in the centre, produced using a special engraving technique developed by De Bethune. Most components are mirror-polished and some of them are also blued, De Bethune's signature colour, as seen here on the bridge and the rim of the balance wheel, as well as on the leaf spring of the triple shock absorber. 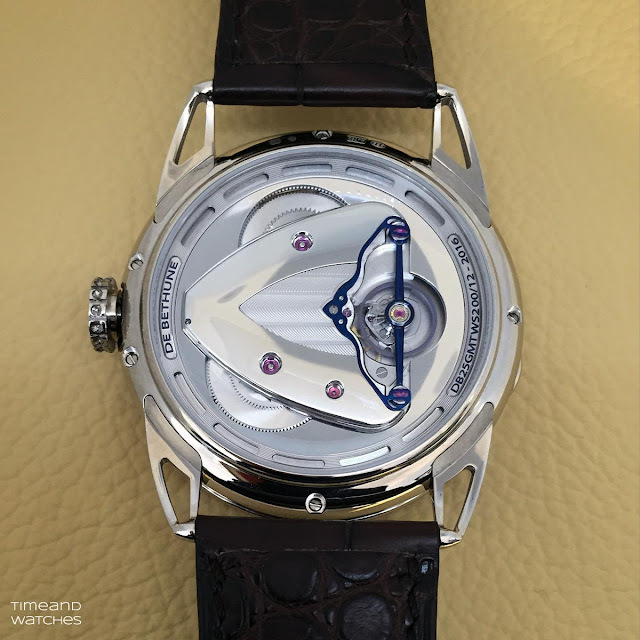 The regulator is equipped with a titanium balance wheel with white gold inserts, developed particularly for optimal management of temperature variations. SIHH 2016: De Bethune DB25 World Traveller. 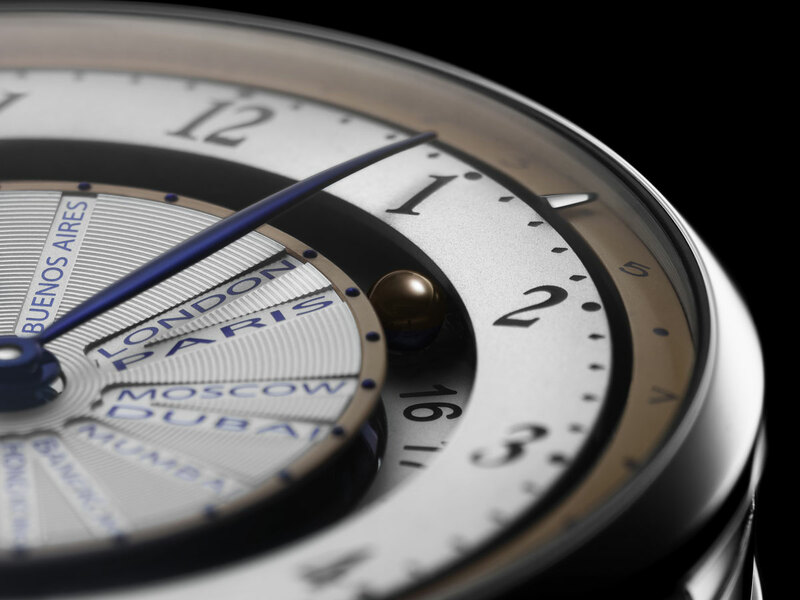 With the new DB25 World Traveller, De Bethune created a second time zone and world time complication watch with an inventive display in line with the design codes of the brand. 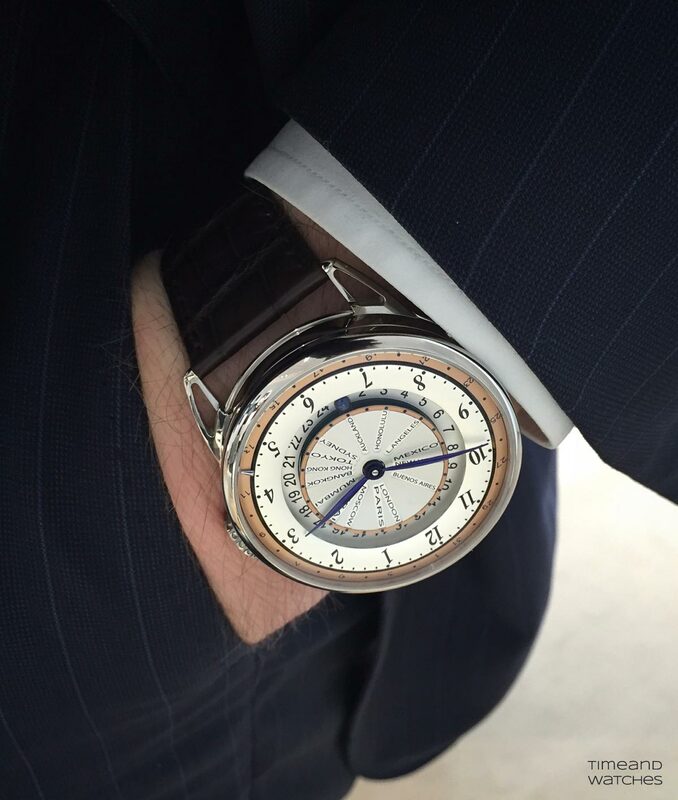 The price of the De Bethune DB25 World Traveller is Swis Francs 150,000.